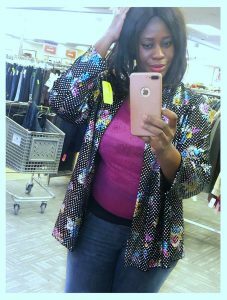 recently from Arc’s Value Village and it really got me excited because I had been on the hunt for a floral or printed sequin piece for years. I only wish I had gotten this sooner, right before the holidays but that’s okay because I’m still in a new year celebratory mood and I’m planning on wearing my sequin pieces this month to Church and other events before I finally give them a break at the end of the month until next holiday season. I have a couple of sequin dresses and skirts in my closet that I have been restyling for years that I plan to wear to Church next Sunday and I knew it was time to get something new. Arc’s Value Village is a thrift store and donation center with four big locations in my city. I do go there to shop for unique pieces from time to time and I have mentioned the store a couple of times previously on this blog. My invitation to do a collaboration with the store is part of its ongoing social media campaign to bring more awareness to the store and the great cause the organization is involved in in helping people with developmental disabilities. 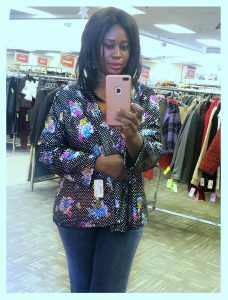 I scored this beautiful floral sequin blouse and a couple of sunglasses with the coupon that I was provided with to shop in the store and as always, shopping at Arc’s clean, organized and well laid out store, was a fun experience. There is new merchandise that comes into the store every week from businesses, stores and personal donations and the items are always in great condition. If you enjoy thrifting just for fun or to score great bargains, you can check out Arc’s online store on ebay. Enjoy the weekend.